In the late seventies, the boys up yonder finally pulled the plug on the King! Lionel was pulled and the Scheiss hit the fan. There was a full page in the newspaper and the switchboard was very busy. By the way, I always had great support from both the World and Tribune (at that time) and all the writers down there. John Wooley and many others came out swinging. This support went back many years, starting with Chuck Wheat. Well, it killed his beady little soul, but Allen Howard had to put us back on! The damage had been done. Now, they decided that we were to have a segment in the news. Terrible idea. But there was method in their madness. Isolating me from any way to interplay with the anchors got them what they wanted. I had to do a show within a show, and it just wasn't the same. The final thing that took care of the problem in one fell swoop was the advent of the Meteorologist. This was sweeping the country. When K-2's Gary Shore took a roll with the dice and predicted snow when the NWS didn't, and won, it was a matter of a short time before I was gone from the six and ten and of course, Lionel too! I was asked to continue doing the weekend weather however, and as I had been working almost full time for Thomas Cadillac, I was not all that unhappy! Especially since they were having to pay me the same (per the old contract) as I was making doing ten casts a week. The weather "SEAL" deal was continuing to grow however and I could see the end was in sight. So, the management told me (two weeks before Christmas) that I would no longer be needed. They also indicated that the P.R. slant would be that it was my idea. So, about three days before my last day, I called my friends at the World and told them that it wasn't my idea! "Clean up the fan!" Well, they didn't like that nor the million dollars worth of bad publicity, but, I wasn't about to let that deal go down! So, here we are on the last night of my career. The audio engineer has been told to cut my mike if I start to say something untoward at the end of my last weathercast! You could feel the sweat factor all round! What did the idiots think I could do to top what had already happened? I finished my segment, thanked the anchors and said goodbye! I will say to all who have waded through all this, that without all the help and interplay of all the hundreds of people who peopled KOTV and their support, it wouldn't have been possible. Nor would it have succeeded without the "Fans!" It is truly amazing to me that today, after not having been on TV since 1982, people still stop me every day and ask how Lionel is. And having traveled across the country, I am stopped in various cities and asked the same question! Pretty fantastic! I leave you with a real Lionel story and one last picture. 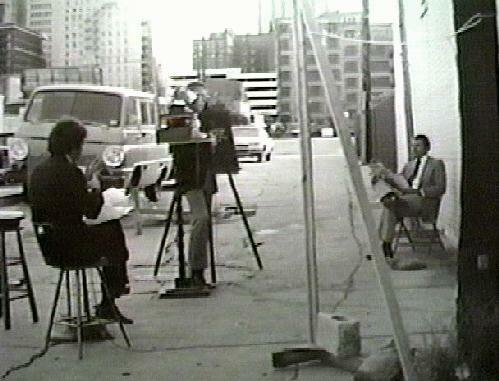 On the six o'clock news one evening, someone brought up the fact that the Circus was in town. Now, this is how Lee and Lionel worked best! No pre-planning...just turn the mind loose. "Let me ask you something, Lionel. Why would any self-respecting lion let a guy stick his head in your mouth?" Lionel slowly turns to me and says: "Beats my deal!" The entire station exploded and they had to go to a break! This signifies what Lionel has now become.